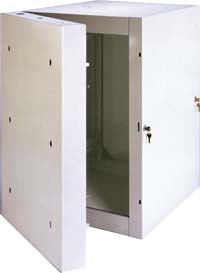 NetCom wall mounted cabinets are perfect for users who require reduced panel height and depth. The Premier NetCom Series WMC is a range of wall mounted enclosures for environments where a reduced amount of panel height and internal depth is required. The design will integrate well with other data communication networking components. The hinged wall mounting back assembly is designed to accept a wide range of cables so that NetCom can be used in almost any location, no matter what the accessibility is. 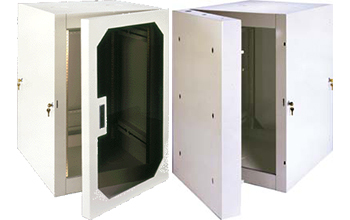 Premier NetCom enclosures mount standard 19 inch assemblies on 2 fully adjustable (front to rear) angles. These angles are tapped with 10-32 holes in a standard EIA configuration. The Premier NetCom cabinet is no lightweight. It’s built with 16-gauge cold-rolled steel and can support heavy loads. There is never any twist or mounting misalignment to contend with. Six wall-mounting slots are provided on all models. Three knockouts on the top and bottom of the rear section are provided for cable and conduit entry. Cable tie brackets are standard on the rear panel. Hinged right doors normally supplied . . . can be supplied with door hinged left. Finished in any Premier standard color.